ArmRx - Not Just A Cast Cover…. 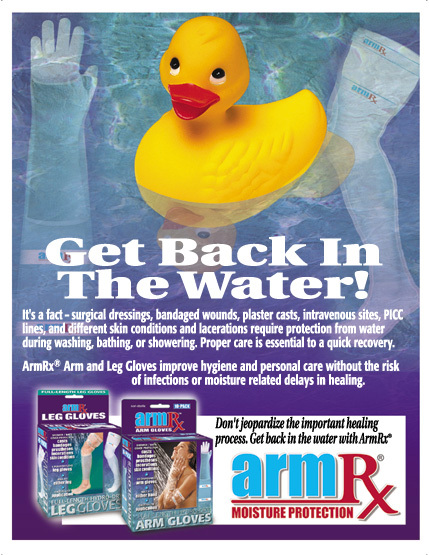 If you think CAST COVER when you think of ArmRx, you’re missing more that 60% of the injuries that require protection from water during the healing period. Consider these facts and statistics the next time you introduce ArmRx to your customers - it’s a heck of a lot more that just a Cast Cover! ArmRx Underwater Demonstration Video - NOW AVAILABLE! We’ve just completed a new ArmRx Demonstration CD - it plays right on your PC using Windows Media Player, Real Player, etc. It’s about 6 minutes long and completely demonstrates the benefits and components of the ArmRx product, fully explains the simple installation of the item, and includes a fully submerged, underwater demonstration of the Arm Glove. 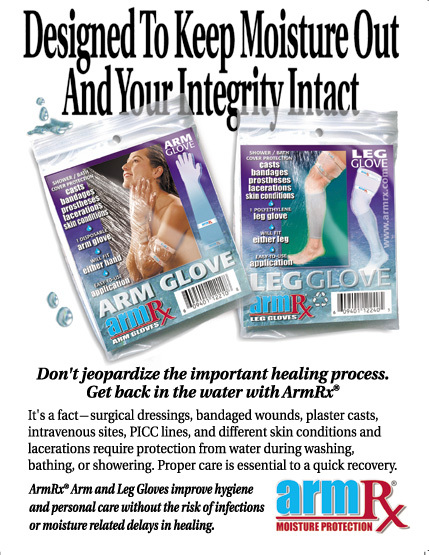 This little demo speaks volumes regarding the simplicity and total effectiveness of ArmRx protecting casts, bandages, IV, PICC lines, lacerations, burns, abrasions, wand any other type of wound site from unwanted exposure to water in the shower, bath, pool or spa. Look for this new under water demonstration video on our website soon! For more information or to request your copy today, call our Toll Free Customer Hotline at (877) 379-3378. 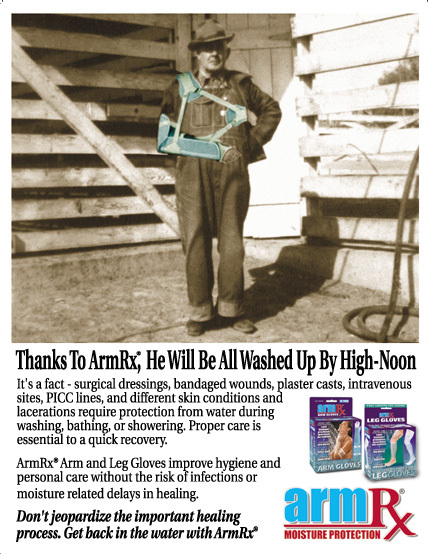 ArmRx is receiving prime exposure during 4th Quarter 2005 at the Home Health Products website. The feature contains an online ArmRx catalog, special fax order offers, and new professional testimonials and endorsements. Home Health Products ,published by Stevens Publishing, boasts both a top national home care products magazine and website and is a leader in home care product news, treatment, and industry information reporting. Home Health Products, also known as HHP, is also working in conjunction with MedTrade to promote new products at upcoming shows. 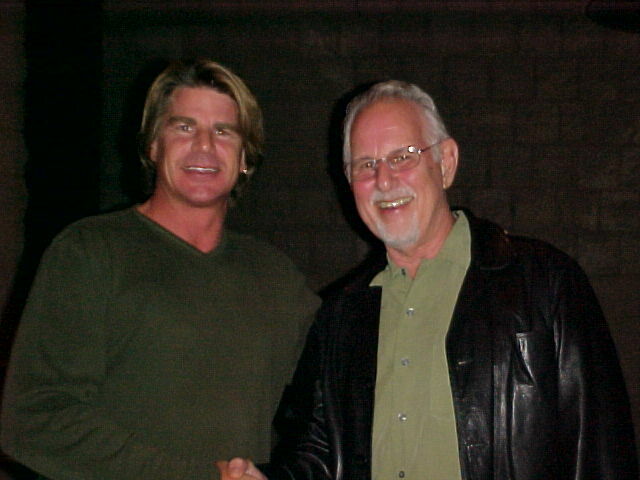 HHP has been a tremendous friend and supporter of the new ArmRx products and believes it’s a product that is way overdue. It’s a fact that patients must keep casts, bandages,lacerations, skin conditions or even IV and PICC lines dry - and they agree a garbage bag and tape is a cumbersome solution prone to failure. HHP wants to help spread the word that professional water tight protection is no longer too expensive or difficult to use and facilitates better hygiene, improves healing and speeds up recovery, not to mention improves quality of life for the patient. Patients who have used ArmRx will tell you “it is one of the most simple and reliable water protection products at a cost everyone can afford - about the price of a fast food lunch!” And for those patients who are impaired with such an injury, a reliable and affordable alternative such as ArmRx can make a huge difference in the personal comfort and uninterrupted success of their healing process. For more information on the different Hydro Dry solutions from ArmRx, visit www.armrx.com or see their feature on the www.hhponline.com homepage. ArmRx Division of Aspen Company, Inc., manufacturers of the new ArmRx Water Protection products, met in Phoenix, Arizona for their annual Sales & Marketing Conference February 15th through 19th, 2005. Discussed at this year's conference were the new patient awareness programs for 2005, the near future release of the new Children's Product line, new USA distributor and dealer acquisitions and the continued expansion of their fast growing overseas distribution. All the new advertising art and marketing slogans were also unveiled. When asked about the most exciting news for New Year 2005, ArmRx states, "the recent cooperative expansion of our US distribution with some of the nation's leading Medical Product Suppliers would be first!". The growth in the hospital and institutional use of ArmRx across the country and their proven reliable product reputation with not a single failure were also reported as highlights. Arabian millennium Trading, the exclusive distributor of ArmRx Waterproof Protection Products in the Gulf Region, introduces the new ArmRx to the Gulf Region medical supply marketplace in Dubai for the first time at the Arab Health Exposition! 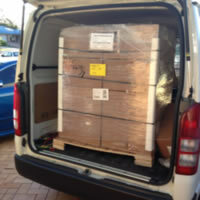 AMT UAE will be exhibiting and demonstrating ArmRx at the Arab Health Exhibition in Dubai between 12 & 15 February 2005. 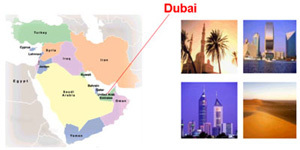 All those attending this International Medical Supply Exposition, please visit Arabian Millennium Trading at Hall No. 3, Stand No. 3621 - 3721 - 4021.